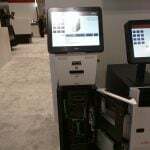 Pictures of units that we took as we toured NRF in NY for 2016. The coolest demo was Diebold actually. It’s hard to miss the high tech, interactive Syracuse visitors’ guides that have popped up around Syracuse jammed full of information and it’s not just for people outside the area. , interactive Syracuse visitors’ guides that have popped up around Syracuse jammed full of information and it’s not just for people outside the area. Tap your way through the touch screen kiosk and you’re connected to places and events all over Central New York. They are strategically placed around the area like the Convention Center, The MOST and Landmark Theater but they’re also moveable for special events. Video news story from news station on information kiosk at the public library and how useful it has been to the general public, especially those without decent (or any) internet connection. Information terminals for the “underserved” or “underconnected” population much like the unbanked. A new part of the Moody Library is the first of its kind in the state. A free standing kiosk is designed to put everything you need to know about the county extension in one easy-to-access place. “We went to topics and then we went to these titles and resources and we just looked at stuff that looked interesting,” 13-year-old Lindsey Richardson said about the new kiosk. The fact that she is even looking at the kiosk is exactly what extension coordinator Lee Ann Clark had in mind. “I run into people every day that they have no clue what extension is and that bothers me and so I am always thinking of ways that I can get the word out about what all we have to offer,” Clark said. At the kiosk, you have access to the hundreds of programs available to you and funded through Alabama A&M and Auburn University.